Click on image of master for his biography. Buddha Vajradhara expounded the innumerable, unsurpassed tantras, especially the Mahamudratilaka, the Sri-anavila-tantra, the Raptu Minepe Gyu, and others belonging to the quintessential tantra. They were entrusted to Guhyapati who then transmitted them to the celestial ladies[dakinis) in Uddiyana. King Visukalpa travelled to Uddiyana, received the key instructions and elucidations from the dakinis and brought to India the extensive teachings of tantric mysticism. Having examined the potential of all his prospective disciples, he found Saraha to be of vastly superior mind-a perfect human devotee predestined to attain instantaneous liberation. As a result of his giving the key instructions to him, Saraha achieved liberation. Saraha then sang the essential instructions and brought about the liberation of many fortunate people. Thus, the lineage of inmost realization came into being, a fact well known to this tradition. Another account, from earlier times, is found in the Dohas, the Datsa, the Gyagar Sangch�, etc., which explain that the perfectly enlightened Buddha saw that the time was opportune for transmitting the wonderful quintessence of the dharma. This occurred around the time he was contemplating entering parinirvana and showing signs of his passing away, after having set in motion the wheel of dharma in three phases in response to the needs of the three levels of sentient beings. At the behest of Manjughosa and Avalokitesvara he travelled to the South and transmitted this quintessential dharma to an assembly of innumerable bodhisattvas gathered together at the city of Vidarbha. At that time the Buddha prophesied that some time in the future there would emerge exponents of this quintessential dharma. These were the two bodhisattvas (Manjughosa and Avalokitesvara), Saraha, Nagarjuna, Savari, and others. Some time later the bodhisattvas Manjughosa and Avalokitesvara-having reincarnated as Devaputra Ratnamati and Devaputra Sukhanatha-transmitted this teaching to Saraha. It was said that he achieved liberation instantly. Another tradition, while mainly agreeing with this account, states that Ratnamati was the reincarnation of Buddha himself and Sukhanatha that of Guhyapati [bodhisattva Vajrapani). This and other variations are not contradictory because, in the ultimate sense, the five perfectly accomplished ones and others like them were stated to be reincarnations of the Buddha. Buddha Vajradhara transmitted his teaching to the reincarnated bodhisattvas who in turn gave it to Saraha, the father of all the great saints of India and the one who helped them to achieve liberation. Saraha transmitted it to Nagarjuna, who was renowned as the second Buddha. Both of them were the gurus of most of the great Indian saints. Nagarjuna especially guided Sri Savarisvara toward his liberation. He belonged to the caste of dancers and was a perfect devotee, predestined to attain instantaneous liberation. According to certain traditions, Savari later received the quintessential dharma from the two bodhisattvas and also from Saraha. They had achieved enlightenment through illusory form or the spacelike mystical form. It is said that these masters appeared before fortunate devotees at the mountain retreat of Sriparvata (i.e. Nagarjunakonda in South India) until recent times. Having come down through a succession [of teachers], the quintessential instructions such as the Druppa Dedjin of mahamudra, the Nyingpo Kordruk, the twenty-four sections of Amanasi, and the extensive and concise texts of the Doha became known in India. Most of the wise scholars and saints of subsequent periods were so overcome with a sense of marvel at this quintessential instruction that they sought out the gurus and the instructions of this lineage. Similarly, the learned saint Maitripa who had also heard of the greatness of this quintessential dharma and that of the lineage traveled to Sriparvata in the South, experiencing immeasurable hardship. When his initial search for Savari was in vain, he made an attempt to take his life, whereupon Savari appeared before him. By and by Maitripa received the transmission. The quintessential instructions contained in the Dohas, Datsa, Sangch�, etc. became extensively known, especially as they were passed on to the Indian Vajrapani [Gyagar Chakna] and from him to others. Tilopa was a reincarnation of Cakrasamvara, the illuminated conqueror, while others claimed that of the bodhisattva Cittavajra. He was said to have visited the Akanistha buddha realm in his subtle illusory manifestation and to have listened to Buddha Vajradhara expounding the doctrine in all its profundity and vastness. Consequently he became the preeminent master of tantric mysticism, like its custodian Vajrapani. Tilopa compiled all forms of creative visualizations into four or six segments, all higher meditations of perfect fulfilment belonging to the father tantra into five levels, while those of the mother tantra into four mudras or six segments. Tilopa was then said to have visited the great country of Zahor in East India [Bengal). By expounding the teachings to a gathering of people, hundreds of thousands of people found their way into the realm of dikinis, thus rendering the city deserted. 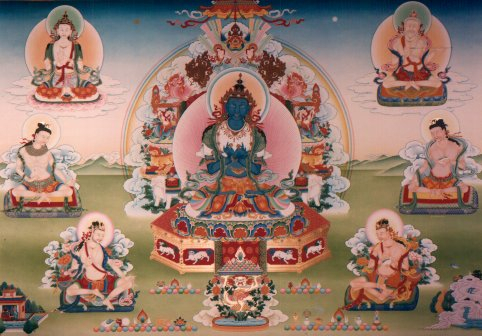 This account refers to Tilopa's miraculous subjugation of the eight saints who in turn liberated innumerable sentient beings, and to the tradition that Tilopa continues to live, performing acts of inner purity in his illusory form as long as the teaching of Buddha survives. Tilopa's assertion that he had no human teachers caused others to be sceptical. So, in order to satisfy critics, he created the impression of having associated with earthly gurus and achieved liberation. Among the gurus from whom he received the four mystic transmissions were Nagarjuna, Krsnacarya, mahasiddha Lavapa, and dakini Subhagini. Having attended other great male and female gurus such as Tengipa and Darika, who were disciples of Luyipa, and his dharma brothers Indrabodhi and Vajraghanta, he manifested the way of liberation. Then there was the great master Naropa who had achieved the mastery of the sutras, tantras, the sciences, and arts as well as the realization of mysticism. Following the prophetic guidance given by Cakrasamvara and a dakini, Naropa went to Zahor looking for the great master Tilopa. Having found and pleased him with his service and hospitality, such as performing the twelve personal ordeals, Naropa received all the key instructions just as the entire contents of a vase are completely poured into another vase. On his return to Magadha, Naropa brought about fulfilment for innumerable disciples. Among the eminent ones were the seven who were comparable to him, such as Maitripa, the hundred and eight saints like Paindapa, the fifty-four male yogins, who attained the purest state through transformation of adverse conditions, and the one thousand female mystics. Besides, there were Phamthingpa of Nepal and the great translator Marpa of Tibet. Naropa also attained enlightenment with the rainbowlike manifestation.